....being a novel interpretation of the Marseilles Tarot. I don't know but I will make an answer up if that makes you feel better. The Tarot is a pictorial and symbolic language that seems to resonate with the structure of the psyche or, at the very least, the Western psyche. The Tarot is a deck of cards. The Tarot is a game with no rules, except those you want to make up. The image above shows a common way of organising the major arcana of the Marseilles tarot. This array would seem to be suggested by the fact that although there are 22 major arcana, only 21 are numbered - the Fool (Le Mat), which has no number, stands therefore outside of the array (see above). Furthermore in arcanum I, Le Bateleur (below), we see three dice upon a table. The visible faces of the dice all show the same three values - 1, 2 and 4, which together make 7: 3 dice that each add to 7. Finally if we take all 22 major arcana together and divide them by 7, the total number on each dice, we have, approximately, the incommensurable pi, which we can represent as 22/7. The circle has always been regarded as the perfect shape, which is to say divine. The tarot is an optical/symbolic language with which we can interrogate the divine order as it manifests itself in/as space-time. It is a language with which we can construct more or less satisfying narratives about our own lives, or existence generally. It is the presence/absence of meaning which is the measure of how good a story is......this is one such story. Le Bateleur is alternatively referred to as a trickster, a 'juggler', a magician; all these designations reveal the first principle of tarot as a metaphysic: ie reality is conjured, illusory. Esse est percipi: nothing exists independent of perception. Here we have the eastern concept of maya expressed allegorically in a Western idiom. The Magician is the 'birth' of consciousness aware of itself. 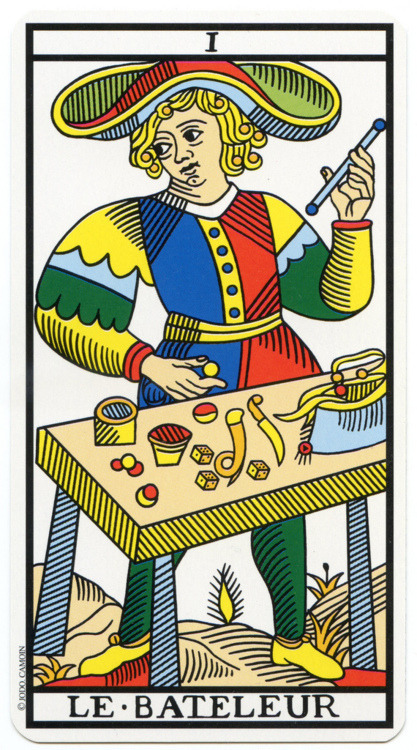 The centre of the card between the magician's legs contains a vaginal shaped portal which is yellow (symbolising will/intelligence) in colour. The cosmology of the tarot is in the purest sense cosmogonical. The Magician indicates a pivot-point.....previously we may have seen ourselves at the mercy of greater forces, insensible or capricious...luck, heredity, fate....with the Magician that relationship is fundamentally altered. We become aware of our creative power not as an adjunct to the operation of the universe, but as its very source of being. The traditional meaning of Le Bateleur is Will. Being a '1', The Magician contains, in potential, the whole series of the major arcana. We could therefore say that the Magician is the keystone of the tarot: it is the coda in which the metaphysic of the tarot is contained. In addition he holds a wand in his left hand and a coin (pentacle) in his right. We have on show all four suits of the minor arcana, represented by the knife (swords), wand, cups and coin (pentacles). These are the fourfold foundation of manifest reality. Swords = intellect; cups = feelings; pentacles = materiality; and wands = power/desire. The water molecule represented here may indicate that water is the medium by which the psyche propagates itself. It has been said that the soul imprints upon water, and Emoto's experiments seem to beautifully substantiate this idea. Water, the universal solvent, is the soul's material 'receiver' and it is therefore sacred and has been seen as such by nearly all cultures, perhaps our own 'culture' being the sole exception. The water molecule is also situated between the two cups, symbolic of the watery domain of feeling. This would tally with these speculations. The coiled object may refer to the kundalini energy, being as it sits directly afore the magician's loins and is coloured orange, symbolic of desire and flesh. This idea that energy can be activated and raised through the psychic centres is a clue to the architecture of the tarot – ie it's progressive nature. In other words energy is made available for the continued development of the psyche/soul through embodied knowledge. It is this idea which will be developed through the 'seven gates of tarot'. So, to recap, we have the fourfold nature of manifest reality (with the quintessence, consciousness, being represented by the major arcana themselves) which is itself predicated upon an inherent duality, the prime symbol of which is the tai chi symbol. Masculine/feminine, light/dark, and especially in the case of tarot – receptive/active. Human life is a bi-polar phenomenon. It is the circuit of energy between two poles which we could call the life current, or elan vital. The fool (Le Mat) stands looking directly at Le Bateleur when he is placed thus above, adding weight to the 'rightness' this particular arrangement. In this position he appears ready to make a journey to his right, which would take him to La Justice. The Fool is the trump card, and to this day remains so in our playing cards as the Joker. The Fool is the highest card of the whole tarot, representing the divine principle in its pure form (the holy fool) and is consequently 'nonsensical' to the human mind. This is why he stands outside of the array (which is manifest reality). It is his journey into manifest (human) reality that begins with the Justice card. Each tarot card is a double square, ie two squares, one atop the other. The top square is the 'heaven' square; the bottom square is the 'earth' square. In addition we can delineate a third, central square which bisects both the heaven and earth squares. This square is the 'human' square. So we have three squares on each card, heaven, human, earth. And if we look at the array above we find that each column of three cards can be seen in likewise fashion: the top row represents heaven, the bottom row earth, and the central row,,,the row into which the fool is about to journey into, this is the row of the human. We now have the concept of the 'gate'. The central human row is where the forces of the heavens and the forces of the earth are encountered and harmonised through a particular kind of activity. Each card in the central row therefore is a 'gate' through which the Fool passes when the cards above and below have been integrated through the agency of the central card. The first gate therefore is the triptych, Le Bateleur, La Justice, Le Diable: The Magician, Justice and The Devil. The designations 'heaven', 'earth' and 'human' are commonly used in reference to the architecture of the tarot above but they do not adequately convey the particular nature of these levels. This is especially true as regards the top row, the row of heaven. In the top row all our protagonists are clothed, often to the point of ostentation. These figures are social archetypes, stations of authority within the context of Western culture. We could indeed call this topmost row the row of culture. In this context we could see the bottom or earthly level as corresponding to biology, or perhaps more accurately as being 'cosmobiological'. 'Heaven' is of course the abode of god or the gods. The gods are a product of culture, they are a creation. It is for this reason we can see the topmost row as representing spiritual or heavenly influences and also being that level we might call 'cultural'. This point is a salient one today because we have lost touch with the strange reciprocity that exists between creator and creation. In other words whilst we may create the gods it is they in turn that fashion us, that make us human. There is a circle here that cannot be broken: men fashion gods; gods fashion men. Giambattista Vico (1668-1744) said, 'As God is nature's artificer, so man is the god of artifacts'. When we consider that 'God' - being a cultural idea - is also an artifact, then the circle is complete. We as creators are mortal but our creations may achieve immortality. Don Quixote still lives even though his creator has long since become dust. The key here is that the engine of human evolution is the imagination. In this sense 'god' is the highest imagination of man. We could also say that god realises him/herself ever more fully through the agency of man, via the mystery of inspiration. This is all about the nature of reality - the irreducible nature of reality. Matter exists as particles and waves, simultaneously. There is the local and the global and they are two sides of the same coin. Our individuality is conjoined absolutely with our collective identity. Indeed it is the hallmark of the true individual (in a Jungian sense) that, ethically, they are turned towards the whole. The individual is the means by which the collective evolves. Another way of looking at these levels is to simply designate the top row as 'conscious', the bottom as 'unconscious' and the human row as that which mediates twixt the two. In this context (which we might again call Jungian), the unconscious is the intelligence of life itself, and its desire to become conscious. The top row is the opposing tendency: it seeks - through knowledge, mastery and genius - to become unconscious. To master something is to make it effortless, this is the concept of wu wei, or action in non-action. Genius is another name for uniqueness. Genius adds something new, a new possibility of life which is open now to all. When Jesus dies on the cross in Kazantkakis' 'Last Temptation' he exclaims, 'It is accomplished! ', to which the author appends the comment, 'It was as if he said "everything has begun."' When something is achieved for the first time it becomes a possibility for all. In this case the archetype of Christ becomes a new (and central) element of the unconscious, a new element which seeks to become conscious, that seeks to grow into the light. Another useful analogy is the idea of inception. In the movie Inception dream 'hackers' seek to implant an idea in a target's unconscious. To do this they must make it seem like the idea is his own. This film, like Fellini's 8 1/2, is an allegory of the process of artistic creation. We could liken all this to the planting of a seed. The seed is not conscious, it is dormant, it is in the nature of a symbol rather than a sign, the seed symbolising that other aspect of evolution - involution, that process of enfolding, as opposed to the unfolding process of evolution. Being a symbol rather than a sign the seed is not recognised by the conscious mind and hence is not resisted by the psyche. The seed waits for the right conditions to germinate, to come to life and grow into the light of conscious awareness, as if it were a natural part of the individual...which it now is. In Inception the aim is to convince the target to break up his father's global energy conglomerate, which he is in the process of inheriting. The target does not have a close relationship with his father and this emotional lack is a point of leverage for the hackers. The hackers implant a cheap child's toy - a windwheel - in the father's safe. On the opening of the safe (which represents what has been locked away or hidden in his father's psyche) the target recognises the toy he himself once had many years ago, indicating that his father did love him even though he did not show it. Freed from his father's shadow he now is free to make his own mind up (or so the target thinks) about what to do with the empire that is now his. He sees that his father was not a happy man and he pities him and knows now that he will not follow his path. What good an empire if you are miserable? The other connection here is that the toy is a windwheel, a miniature windmill or wind turbine....and that the empire is an energy conglomerate. The target may now know what he wants to do, to focus his energy on renewable energy, knowing that doing so will make him happy as well as rich. The 'breaking up of the conglomearte' could be seen as a metaphor for the devolution of power and production. We are at a historical moment where the process of centralisation and concentration of power ('the conglomerate' - whose business is power) is creating instability and inefficiency. In order to devolve power, in order to stave off impending global catastrophe there needs be a new direction, a new desire. The son can no longer follow the father. So here we have the 'metamagic' of art. Whilst absorbing the viewer in a very intricate story (thereby requiring focus, attention, which cultivates a receptive state) about a man having his mind messed with, subtly and expertly, such that he goes away with a new intention that he takes for his own but has in fact been implanted...well the same thing is being done to us, at the very same time! And the result, in my case, is that which I have written above. Are these my thoughts or Christopher Nolan's? In conclusion, before we journey into the archetypes themselves we must apprise ourselves of the nature of the universe we are treading. We can already infer much from the architecture of the array and the structure of the cards themselves. Contrary to Christian orthodoxy here we have a metaphysical picture with two poles, not one. God they have in common, but in Tarot there is also - equal and ostensibly opposite to God - another deity. Man sits between the two and is the bridge between them. This other deity Jung called 'Sexuality'. Another name would be 'The Devil'. Techpave face juggler ap is awesome. free love tarot reading is awesome and very very free for unlimited time. Get your today or any day !